Picasso is sufficiently interested in drawing and engraving to make frequent use of composite techniques. 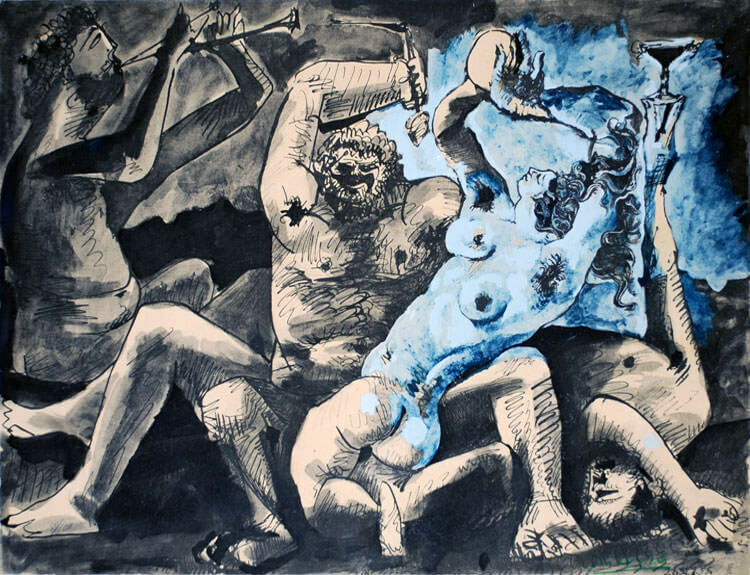 A work in Indian ink heightened with gouache, entitled Bacchanale,, combines the procedures of wash drawing, pen-and-ink and gouache in a splendid composition, in which there is not a single empty space, forcefully centered on Bacchus and a sinuous Bacchante framed by an overturned drinker and a piper. This filling of the picture plane with figures, this horror vacui, reveals a certain indifference to the pictorial value of space and a preference for forms viewed from close up. Like chamber music that must be listened to for its own sake, Picasso's drawings evade the limitations of book illustration. They express his wit, his obsessions, his longings, his deep-seated love of play, in absolute freedom with a pen or brush that ignores the fixity of painted or sculptured signs and reflects the mobility of an elusive temperament.